Started building up your cash savings? Congratulations! You've already overcome the first obstacle to building wealth. It's important to have a savings fund that can help protect you against emergencies -- and to help you make big purchases like buying your first home. However, many Americans never take the next step to begin investing. According to a recent study, over 57 percent of Americans keep their savings at the local bank. And 29 percent keep their savings in cash -- and more than half of those people keep their cash in a secret location at home. 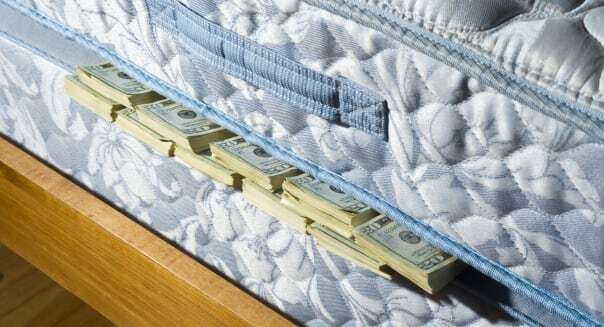 Stop putting money under your mattress or in your underwear drawer, people! This is a problem, because inflation will eat away at your cash savings over time. You also subject your cash stash to human mistakes. Here's why you need to avoid saving large amounts of cash at home, what to do with it instead, and the importance of creating an investment plan for some of that cash. If you have more than a few hundred dollars sitting around the house, then you have too much cash on hand. Sure, it's nice to have a bit on hand if an enterprising kid offers to mow your lawn. Perhaps you're using an envelope budgeting system, each one filled with predetermined amounts of cash. But if you're hiding cash because you don't feel like it's safe in the bank or invested in the stock market, that's a mistake. You're putting your hard-earned money at risk in a variety of ways. It's highly likely that you won't be protected in the event of theft, fire or natural disaster. Renters and homeowners insurance typically cover only $200 in cash. And what if you forget about where you stashed the cash? (It happens!) Your money will be safe in the bank. If you put your extra cash in a FDIC-insured account, you'll be protected for balances up to $250,000 even if your bank goes out of business. Having your emergency savings in a high-yield money market is a great place to start. I like Ally bank (ALLY) and CapitalOne 360 (COF) because you'll at least earn close to 1 percent on your money. Most big banks are paying around 0.1 percent on savings, so if you have three to six months of your income set aside for emergencies, you could earn a few hundred dollars a year just by moving it to an online bank. Once you have a solid emergency savings and you're still hoarding cash, you're ready for the next step. It's important to keep some of your savings liquid. If you're debt-free, aim for three to six months' worth of net pay in an savings account in case of an emergency. But beyond that? It's a better move to invest the money. When you're earning a less than 3 percent interest rate on your money, your cash is losing purchasing power thanks to inflation. The cost of living increases by about 3 percent every year, but you earn less than that in even "high-yield" savings accounts at credit unions or online banks. Historically, over the long haul, by investing a portion of your savings, you'll increase the value of your money over time because of compound interest. At least, that's the goal. There are no guarantees when it comes to the stock market. Yes, investing carries risk. But you should be investing for the long term, which means you'll invest your money -- and keep it invested -- for 20 or 30 years. Remember, the stock market has historically returned an average of 8 percent to 10 percent a year, depending on who you're talking to. Investing early and diversifying your assets will help you ride out the highs and lows of the stock market. Don't let those market fluctuations scare you off and encourage you to leave your savings in cash. If you leave the money in an investment account, even when the market is down, it's a paper loss. It's not an actual loss until you sell. If you sell your investments and move to cash, you're locking in your paper losses for a real loss with no hope of growth. As an investor, your accounts will change in value constantly. However, if you stick with investing through the ups and downs, you'll end up with more money over time. Risk is real, but it comes with everything. Even cash savings. Remember, if you don't invest, you're guaranteed to be losing out to the power of inflation. Whether you're afraid of investing or you just aren't sure how to begin, it's time to start your investing education. Choose an asset allocation that makes sense for your situation and goals, and make sure your portfolio is diversified. If you have a large amount of cash on hand, you can also tiptoe into the market by buying in consistently over time. This strategy is called dollar cost averaging, and it helps you buy into the market at a variety of prices. If the idea of investing is overwhelming, get in touch with a financial planner. A great certified financial planner will walk you through all the steps of investing and help you stay the course emotionally through the ups and downs of the markets. Sophia Bera is a virtual financial planner for millennials and the founder of Gen Y Planning. She is location-independent but calls Minneapolis home. She offers a free Gen Y Planning newsletter and is getting ready to publish her first ebook to provide a Gen Y guide to empowered personal finances.